We are a leading supplier of waste tyre/plastic/rubber PYROLYSIS EQUIPMENT and waste oil DISTILLATION EQUIPMENT. 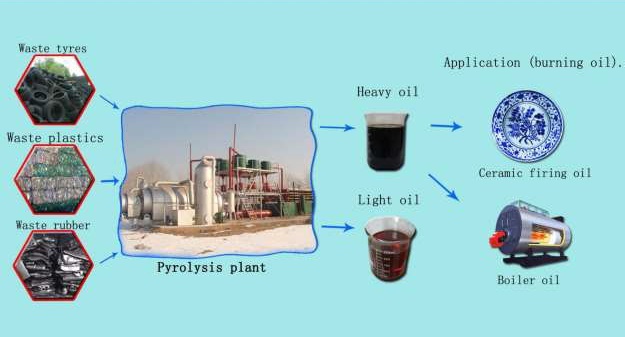 Pyrolysis Plant (furnace oil from waste tires) Call 01716752370 for machinery (cost of plant). A. Feeding the reactor with raw material through the feeding door by labor or machine and then close the door tightly. B. Heat the reactor with coal, wood ,natural gas or other fuels. C.Some harmful smoke will come out along with the heating, but it will be removed by the dust remove system. D. The smoke from the exhaust disposal system is no different from the air. The draft fan helps to inhale the smoke from the pipe and then release into the sky more quickly. E. The oil gas will travel from the reactor to the gas separator, in which the heavy oil and impurities will be departed from the gas due to the gravity. Then the gas will continue its journey into the depositing tank for a second separation. 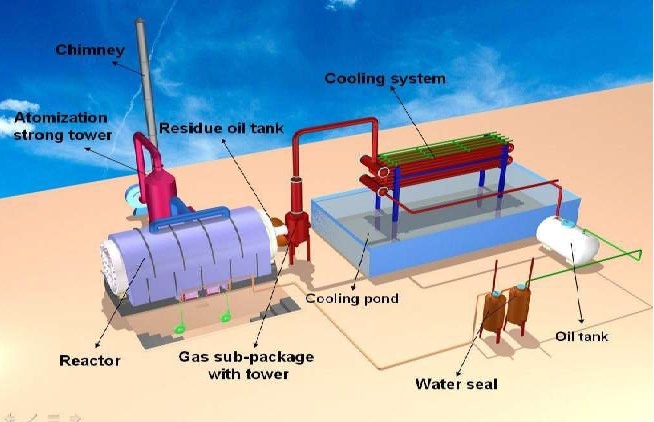 After that, the cleaned oil gas will run into the cooling condensing pipes in the cooling pool, where the gas will convert to liquid, the oil, and then flow into the oil tank for storage. F. There will be some waste gas in the oil tank. It will follow the pipe over the oil tank into the cooling pool for a second condensing so that the remained oil gas could turn to oil to improve the oil yield rate. G. As for the waste gas, which cannot be transformed into liquid will go into the water sealing and then to the furnace for burning. It is not only environment protection but also energy conservation. The boiler material is Q345 R and the thickness of reactor is 14mm/16mm. Our pyrolysis plant adopts electronic control cabinet, which can save workers and easy- operating. Waste gas recycling system, using two sets of water sealing. It can ensure the waste gas reused more safely and effectively. The recycled gas to heat the reactor makes the plant environmental and fuel-save. Automatic submerged welding technology and ultrasonic nondestructive testing guarantee the workers and plant safe. It can also prolong the use of the plant. Desulfurization dust removal design, through the spray, purification, adsorption can be more effective to remove acid gases and dust, environmental protection free from contamination. We have different types of 5t, 6t, 8t, 9t, 10t and 12t pyrolysis plant in our factory.There is running pyrolysis plant in our factory. Welcome to our factory at your convenient time. 1) The distillation plant can deal with used motor oil,waste Engine oil, waste tyre oil, crude oil and shale oil to diesel and gasoline. 2) The diesel can use in diesel generator set, ship, big truck, forklift, agricultural machine , etc. 3) There have 5, 10, 15, 20 and 30tons of the plant in our factory. 4) Our distillation plant of high automatic,and can be fully automatic continuous production. You just need 2 workers to operate it. 5) Use flash distill and , ensure high oil yield, reach to 85%-90% . The diesel sulphur content low to 0.015%, Environmental. 6) Use coil condenser,Have many pipes in the coil condenser,and water in the coil condenser cooling the oil in the pipes,Good cooling effect and the waster can recycling use. 7) washing oil system,make the oil have a better quality. 8) Oil residue can be used as asphalt, there is no waste. 9) our plants have the ISO,CE and BV certificate, environmental protection and good service. The seller sends the foundation drawings to the buyer after making the order. Our factory takes charge for the installing,debugging, training the buyer’s staff. He will not leave until the machine running normally. The buyer shall be responsible for each technical engineer’s accommodation, round-trip tickets, self-security and salary USD90/day. Two years guarantee for reactors.As normal,the reactor can be used more than 8 years. Other parts(except wearing parts) guarantee for one year. Life-long maintenance for whole equipment.